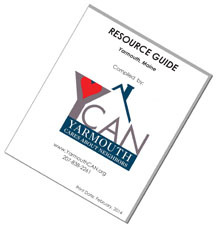 Yarmouth Cares About Neighbors (YCAN) will once again be coordinating Holiday Gifts for Yarmouth, Maine families in need of help with gifts for their children. We request that all applications be returned to us as soon as possible to give our Elves more time to shop, but no later than December 1st. Now that the holiday season of 2014 has come to an end, we would like to thank all the many people in Yarmouth who helped others have a few more things to celebrate last month. Thanks to the many, many kind donations of food or funds to the food pantry, as well as the numerous volunteer hours that went into sorting food, preparing food baskets, and helping with distribution, the Yarmouth Community Food pantry provided holiday meals for 292 adults as part of Project Holiday. And, thanks to the many, many donations of gifts and volunteer hours, the Project Holiday team supplied holiday gifts to 109 children from 46 families. Thank you to all who helped by donating space, food, gifts, time, and/or funds! Yarmouth is a town that cares about its neighbors… Thank YOU! Posted on January 7, 2015 November 7, 2015 Author ycan11Categories UncategorizedTags Food Pantry, Project HolidayLeave a comment on Project Holiday Thanks YOU! A Big Thank You from Project Holiday! Thanks to the Yarmouth Community for being part of “Project Holiday” 2013. This Holiday Season we were able to help 29 Yarmouth families (68 children and 59 adults) who would otherwise have very little to celebrate. The Yarmouth Food Pantry gave out over 50 food baskets with turkeys and all the fixings. Posted on December 31, 2013 Author ycan11Categories YCANTags Food Pantry, Project HolidayLeave a comment on A Big Thank You from Project Holiday!